This research was conducted based on the issue of the learning process less effective. The purpose of this research is to improve the results of mathematical learning through peer tutor groups method. This research was conducted on grade V SD Negeri 2 Shaman Krinjing Magelang Regency. The design of this study using a research action class that consists of two cycles. Each cycle there are four stages, namely planning, implementation, observation, and reflection. This research consists of variable input in the form of the results of learning math is low, the process variables in the form of peer tutor groups, methods and variables are output in the form of higher mathematics learning outcomes. Data collection method using tests and observation. 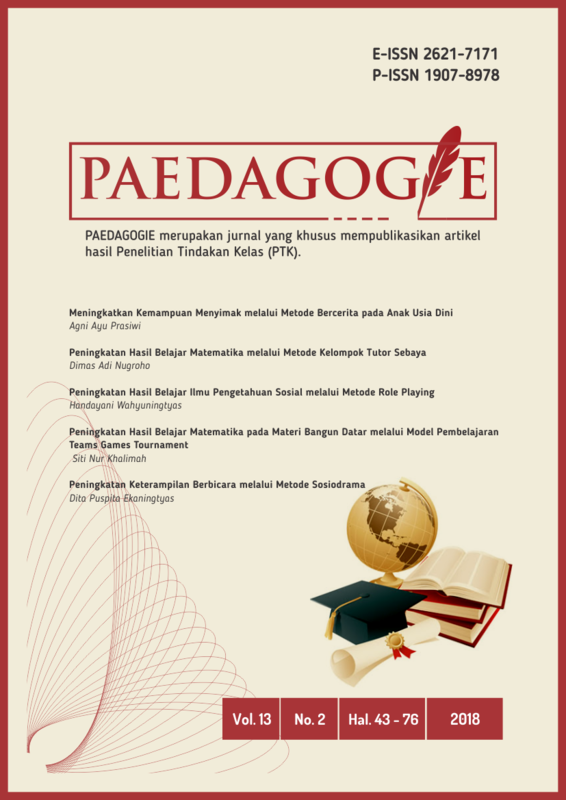 The conclusions of this study, namely the application of the method of peer tutor groups can enhance the results of learning math grade V SD Negeri 2 Shaman Krinjing Magelang school year 2016/2017. The results of this study showed that there was increased after the action. This is proven by the results of the study before action amounted to 23% increase in cycle 1 of 38% and in cycle 2 to 76%. The results ofsuch research has showed that the indicator of success has been achieved, namely75%, so this research is declared successful.